That was head coach Andy Coen talking to Lehigh Sports’ Steve Lomangino after the Mountain Hawks’ 42-21 win over Bucknell. With their Patriot League title hopes on the line, and the No. 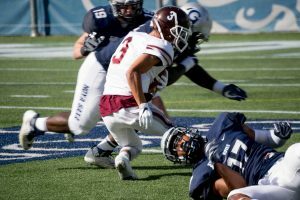 1 defense in the Patriot League the opposition, it seemed like the Mountain Hawks might enter into the type of defensive struggle that defined last year’s game against Bucknell. But after junior LB Mark Walker forced and and grabbed a Bison fumble and returned it to the Bucknell 9 yard line, junior QB Brad Mayes didn’t mess around. the last time the Mountain Hawks went to the Bronx and came away with a win was in 2011. Even before RB Chase Edmonds then broke a Patriot League single-game rushing record against Lehigh in their 59-42 win in 2015 – a record he later broke against Lafayette – Lehigh lost a 52-34 shootout in the Bronx in 2013 as well. In the last two games in the Bronx against Fordham, Lehigh has allowed a 50-burger, as they say, two straight games. That was only marginally as painful as the 2015 game, which also happened to be the debut of junior QB Brad Mayes after QB Nick Shafnisky came out of the game after a late hit during a 2 point conversion. Mayes very nearly rallied the Mountain Hawks to make it a one-score game, but a missed FG try ended the dream, cemented be a 75 yard touchdown run by – who else? – Chase Edmonds. Suppose you put in a copy of NCAA Football ’14 into your dusty Playstation 3. You create a team, “Lehigh”, and put in the entire Lehigh roster, and make them 99s across the board. You pick a team to play against – say, Yale – and you pick a place to play, of course, the Yale Bowl. You put it on the medium setting. Would these stat lines seem out of place if you played that game on that system? Sophomore QB Brad Mayes – 33 of 46 passing, 524 yards, 6 touchdowns, 0 interceptions. Junior WR Troy Pelletier – 13 catches, 213 yards, 3 TDs. Junior WR Gatlin Casey – 6 catches, 169 yards 2 TDs. They look like something out of a video game – yet those are the real stats to come out of the Yale Bowl this weekend in an extraordinary, awesome, ridiculousness of an offensive performance. These numbers weren’t the only great numbers to come out of this record-setting game out of the Yale Bowl, but they stick out. At 1-1 and the experience of a tough loss still fresh in everyone’s minds, winning this weekend at home and gaining momentum going forward into the rest of the season was the theme of the week. This Saturday, the 2-1 Mountain Hawks at the end of the afternoon had fulfilled both objectives. 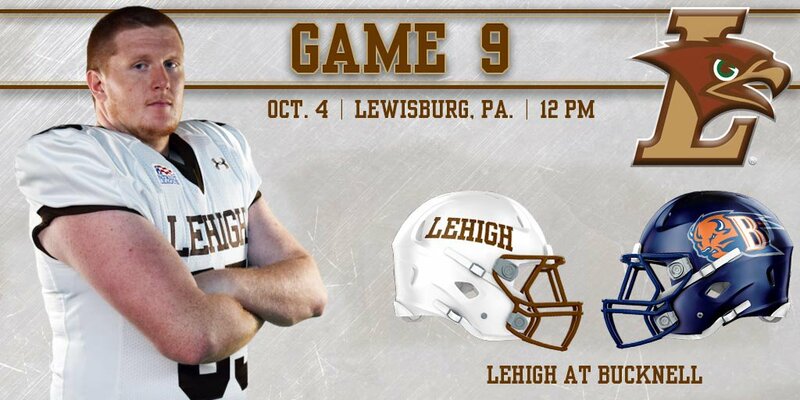 Lehigh’s 42-21 doubling up of Penn wasn’t a game of perfection. But it was a devastating Mountain Hawk offensive performance, coupled with enough big plays on defense, to get a very satisfying win for the home crowd of 6,971 on hand on a sunny, somewhat humid afternoon. It doesn’t take an Engineer to see that much is expected of Lehigh football’s underclassmen this season. Freshman. Freshman. Sophomore. Freshman. Sophomore. Football is the ultimate team game, where experience counts in terms of knowing what it takes to win Division I football games. Yet up and down Lehigh’s roster, it’s very evident: to win in 2015, head coach Andy Coen will be relying on his underclassmen in a big way – underclassmen who will be a big part of this season.